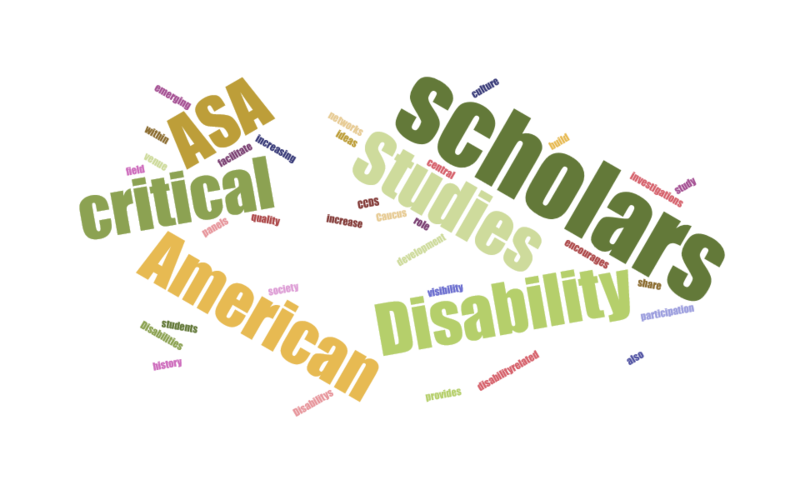 The Critical Disability Studies Caucus (CDSC) connects scholars engaged in the critical investigation of disability’s central role in American history, society, and culture, and works to increase the visibility and participation of scholars and students with disabilities within American studies. The caucus provides a venue through which scholars of disability can share ideas, build networks to increase disability-related panels at the ASA, and facilitate the development of emerging scholars in the field. A new mentoring program for scholars at all stages of their careers. Honorable mention: Ittai Orr for "Robert Montgomery Bird’s Neurodiversity Hypothesis"
We call on the ASA board and administration to ensure optimal accessibility in the organization and its meetings. Information about accessibility at the annual conference can be found here. Guidelines for session organizers and presenters on accessibility can be found here. Caucuses offer a unique balance within the association between informal collaboration and organized structure. These groups are open to all members and are largely driven by volunteer efforts. If you would like to get involved with the CDSC, please view our contact information in the sidebar to email the caucus co-chairs, join our Facebook page, or sign up for our listserv.